"Getting Started with Customizing Dynamo for the Non-Programmers Using C#"
has been rated the top lab class at AU2018! If you want to see the class click on the link here. I want to thank everyone who has followed me on this blog, listened to the podcast and supported my efforts to help the AEC community over the years. 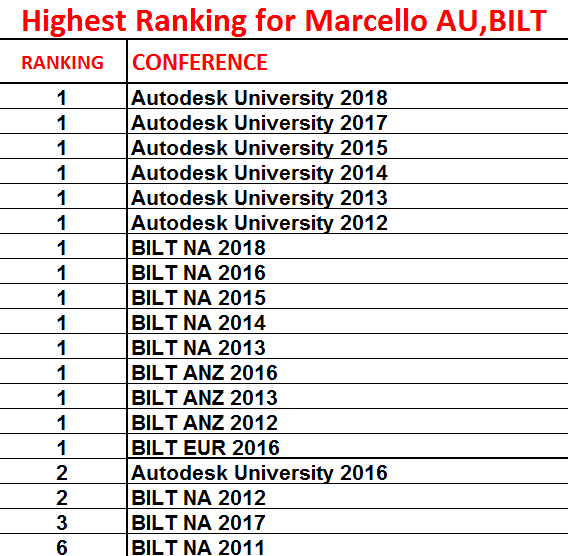 I never dreamed in a million years I would ever be teaching at such great conferences such as Autodesk University and BILT let alone winning any top speaker awards. 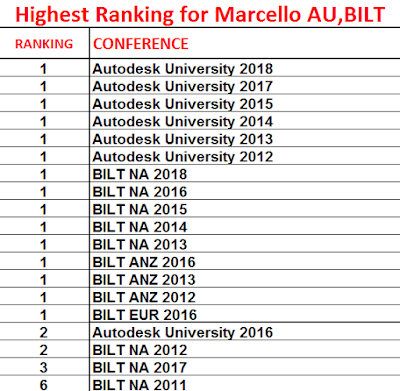 If you were ever curious how my speaker ranking landed for each year I presented at both these conferences since 2011 see the image below and Thank you again. Marcello, we cannot download the pdf hangout and presentation from AU... The video works though. The Podcast Roundup – Episode 067 – Apr. 14th – Apr. 20th, 2019.